Didn't the change in weather come upon us very quickly this year? It has been quite some time since we have experienced such a "Winter's" Winter. I have taken to wearing so many layers of clothing that I have had to increase my time management at the start of the day ... and when I wish to go to the bathroom! It has been a productive year, so far, and there are some new initiatives that you may like to tap into. These include Wellness Coaching, new classes and nutrition updates. 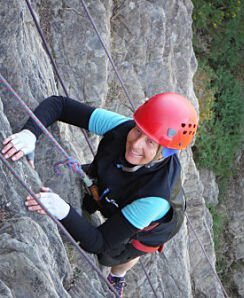 Also included in this newsletter is the inspirational story of Pam Foster, who recently completed the "Aspire" Outward Bound course for Disabilities. Keep active. It will keep you warm! "The Greatest Pleasure in Life is Doing Things Others Say You Cannot Do"
"Diabilities shouldn't define who you are. It's what you do that defines you and never let what you can't do stop you from doing what you can." Profound words from long time Nordic Walker, Pam Foster. Pam has successfully completed an 8 day "Aspire" Outward Bound course for people who have a disability. From a young age, Pam suffered from hearing loss which significantly worsened during her thirties. Despite hearing aids, the loss of hearing function caused her to slowly retreat into herself. Deafness is an invisible disability and her way of communicating became limited. She found that she was not socialising and became isolated. "I have heard sounds that have been silent to me for years, like birds and the sound of waves on the beach. Doing the "Aspire" course definitely took me out of my comfort zone ... but it has allowed me to take another look at life." Well done, Pam. Your self supporting behaviour (and beyond) is very inspirational. Where as a Sports Coach teaches people a physical skill, a Wellness Coach works with clients to help them identify their reasons, motivation and barriers to making lifestyle changes. Just about everyone has a vision of his or her ideal life, but haven’t quite made it a reality. In identifying goals and implementing change behaviours, new habits are created for a healthier lifestyle. Through small, doable steps, a person begins to master their wellness and optimal health. Goals may include changing mental and physical behaviours relating to nutrition, weight, exercise and stress management. Strategies are client-centred to develop their overall strengths and abilities. June has recently completed her Wellness Coaching certification and is now available for consultations. 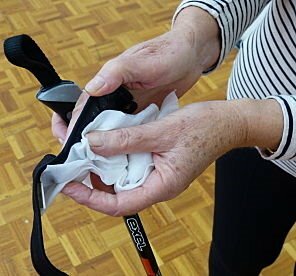 For people who have learnt the basics of Nordic Walking and wish to improve their fitness, strength and flexibility. Includes balance and leg strengthening exercises and ongoing technique reviews. Saturday 9:30am at various Auckland locations. 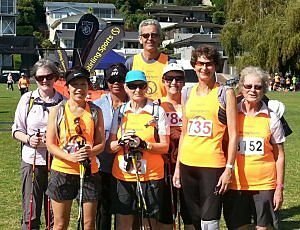 For those experienced Nordic Walkers interested in their extending endurance for events and increasing fitness and strength. Includes "parkour" style mobility training and technique reviews. 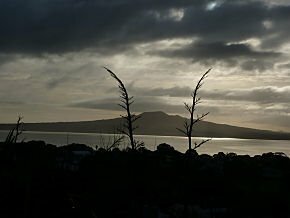 Sunday 8:00am at various Auckland locations. In recent months there has been a lot of discussion in the media about the food pyramid. This has ignited controvesy within the scientific, medical and nutritional fields. Many people have become confused as to what they should be eating to be healthy and manage their weight. For the past 18 months, I have been studying these trends. In February, I attended a Medical and Nutrition conference in Cape Town. 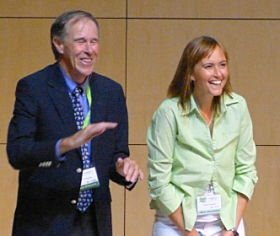 This conference was hosted by Professor Tim Noakes, who is world-renowned in the field of Exercise and Sports Physiology. The conference organisor was Karen Thompson (grandaughter of Dr. Christiaan Barnard), founder of Harmony Eating and Lifestyle Programme, an inpatient clinic for sugar addiction. I have learnt about the impact the last 50 years of dietary guidelines have had on the Western diet. High rates of obesity linked to diabetes, heart disease, cancers, arthritis and so on. From my research, I believe there are some changes we can make to our diets that will have an immediate and long lasting effect on obesity and medical conditions. In September, I will be hosting an interactive discussion where the key findings will be presented. If you would like to attend this meeting, please RSVP as soon as possible as the proposed venue has limited space. At the conclusion of your walkout, it is recommended that you wipe the pole straps and handles with a cleaning wipe. This will ensure that sweat does not cause the straps to perish and clean straps will reduce the liklihood of skin irritation and infection. You can reuse these wipes. Put them through the wash as they make great cloths to clean your glasses and computer screen. Dampen the wipe to keep flowers and cuttings moist. Also use as a cosmetic sponge or for parcel packing. They are also a very handy tissue.